The DING WiFi Video Doorbell might not have the name recognition that the Ring Video Doorbell 2 and Ring Video Doorbell Pro have, but don’t let that keep you from checking it out. It’s only $59.99, and it’s Amazon’s best-selling video doorbell for a few other reasons, too. 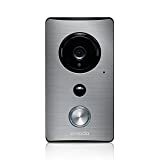 First, it’s easy to install and it has all the features you would expect from a video doorbell. It also has some features you wouldn’t expect, like a 6-month trial of DING’s 7-day cloud storage plan for free! Just use the code FREEAM04 when you set up your account in the app.